Finally the NBA is back and it’s time for us to make some money! We’ve been absolutely dominating the NFL week in and week out and it’s time to move our talents over to NBA as well. What we do on this blog is bring you suggested plays of the day to help you build that winning lineup on Fanduel and Draftkings. These are considered the FREE advice articles. If you’re wanting to subscribe, head on over to thefantasysportsguru.com and hit the drop-down menu on the right side under the ads and choose the subscription plan that is right for you! With the subscription service, you are sent the email that day with a couple of suggested lineups that we use on that night. Thank you for checking out our service and good luck this NBA season! Once you’ve subscribed, please send me an email with the email you want the article sent to, and that you subscribed for NBA. NFL is still going on and I don’t want there to be in confusion! C- DeMarcus Cousins- He's my #1 target tonight and I'm expecting big things from him. He had a great game Wednesday against Golden State while playing 31 minutes with 20 points, 11 rebounds, and 30.7 FP. He's got a tremedous matchup against the Trailblazers. I'm expecting upwards of 35 minutes and 45+ points from the big man tonight. SF- Kawhi Leonard- He's missed the final 6 preseason with an eye infection but I believe the Finals MVP is primed for a monster game against the Suns. I'm looking for 25+ minutes and around 30 FPs. PG- Chris Paul- I think he's primed for a monster season and if last night is any indication, he could have a huge game tonight. Last night against OKC, CP3 played 38 minutes scoring 22 points, 44 rebounds, 7 assists and 45.3 FP. I'll be looking to stack the Clippers tonight against the Lakers. PF- Blake Griffin- Like I said about CP3, I think this Clippers team is primed to dominate. Griffin tore apart OKC going for 38 minutes, 23 points, 7 rebounds, and 34.9 FP. I know it's a back to back night but they are facing the Lakers tonight. I'm looking for a repeat performance for both CP3 and Blake Griffin. C- Marc Gasol- I'm pretty excited to see what Gasol will do tonight against this different-looking Pacers team. Wednesday against the Timberwolvs Gasol dominated going 37 minuteswith 32 points, 9 rebounds, 2 steals and 52.3 FP. I think the Grizzlies dominate tonight and Gasol will lead the charge. PF- Zach Randolph- Along with Gasol, I think Z-Bo will play a pivatol role in the dismantling of the Pacers. Against the Timberwolves, Randolph went 35 minutes, 25 points, 13 rebounds, and 41.1 FP. I wouldn't be surprised if he eclipsed the 50 FP point mark tonight before taking the bench in a probable blowout. If this game stays close, Z-Bo could go off! SF- Lebron James- Wow, he had one h eck of a homecoming last night, and not in a good way. In what was the second coming of the King (like Jordan coming out of retirement). James stunk it up plaing 43 minutes scoring only 17 points with 8 turnovers and only 21 FP. I think a ton of people will be off of him tonight but I think he will rebound and be his old self. For more in-depth articles, and actual Fanduel lineups we use for that week, be sure to check out thefantasysportsguru.com and click SUBSCRIBE on the ADS on the right hand side of the page. Remember to hit the subscribe button and get the full articles to fast-track your way into the money! Good luck tonight and bring home the bacon. Week 8 brought some high fantasy scores, led by guys such as Ben Roethlisberger, Jeremy Maclin, Rob Gronkowski, and Arian Foster. After the low scoring in week 7, the hopes and prediction was week 8 would be an explosion of points, and it sure was. What’s in store for week 9 you ask? Well since I can clearly see the future and read minds, I know what all of you are thinking this week, “I got 99 problems, and the bye week’s one.” Now again, I know exactly what you are thinking, and yes, those are the actual lyrics straight from Jay-z, and I could not have said it better myself. We have six teams on bye this week, and a lot of them have important fantasy starters. Atlanta, Buffalo, Chicago, Detroit, Green Bay, and Tennessee all are taking the week off, which means you need some guys to plug and play. As suggested, sit or start the players below and let’s all get a big win together. We are getting down to the nitty gritty here in the 2014 fantasy football season and are all seeking a playoff spot, let’s go! Colin Kaepernick vs STL – The Rams did not give up much last week to Alex Smith, but you have to like Kaep and the 49er’s off of the bye. They’ve had two weeks to get situated and are playing at home in a divisional game. Two weeks ago these same Rams gave up 106 yards on the ground to fellow mobile QB Russell Wilson. He also threw for over 300 yards and 2 touchdowns. I like Kaepernick a lot this week, even if I am playing against him in one of my leagues league. Russell Wilson vs OAK – Back at home for the first time in 3 weeks, I think Wilson and the Hawks will be happy to get home after tough road games vs St Louis and Carolina. Last week, Hoyer was able to put up 275 yards through the air. Wilson is going every other week the last 4 weeks with big fantasy performances and this just so happens to be an “every other.” The Seahawks need a blowout win to get back to normal. Watch them pour it on Sunday. Ronnie Hillman @ NE – New England has been getting gashed on the ground all year long. Now without Mayo the last few weeks, they cannot stop anybody. They also have one of the best pass D’s in the game. Not saying they are going to stop Manning, but look for the Broncos to get Hillman a few more touches than normal. The Pats are giving up nearly 130 rushing yards a game and Hillman is highly involved. They’ve been lining him up everywhere, except the goal line that is. They will get him a score this week after two got vultured in week 8. Ahmad Bradshaw @ NYG – Trent Richardon’s status is still up in the air, so hopefully Bradshaw is in line for another feature back day. He didn’t get many carries last week after the Colts fell behind early, but he is always involved and scored again. The Giants are pretty generous vs the run, I like him this week, especially on Monday night to give you the win on a Monday Night Miracle. Doug Baldwin vs OAK – Since the Harvin departure, he’s had a line of 13-184-1 on 19 targets. He’s clearly Wilson’s number one guy and I do like the Seahawks to win big this week, they need it. Coming back home, I like Baldwin to get in the end zone and have 7-10 catches. Andre Johnson vs PHI – He was on here last week, but didn’t quite live up to a “good call,” as he caught 7 passes for 55 yards. He is always involved, so the targets are never an issue. We just saw Philly give up a big game to Fitzgerald and Brown, so hopefully Johnson can do the same. Only one touchdown on the year, but the yardage should be there this week. Cordarrelle Patterson vs WAS – Fool me once shame on you, fool me twice? Well I guess we will see. One of my man crush’s before the season started proved me right in a huge way in week one. He ran left, he caught right, he scored touchdowns down the middle. Since week one he has not done a thing, until last week where he had his most productive game since the week one bust out. I’m a sucker for Cordarrelle and that is why he is back on this list. Finally involved in an offense who desperately needs a spark he had 7 touches for 96 total yards, he also had 12 targets. Not sure why they have not manufactured him more touches, but he has a good matchup, and I’m going to give him another shot in my line up… fingers crossed. Wes Welker @ NE – A pure hunch play. Has not done a thing this year except for the TD in week 7, but with a lot of wr’s on bye this week, he is an option. Playing his former team he will obviously want to be involved, but don’t be shocked if they throw him a bone and get him in the end zone on one of his patented arrow routes. Not expecting big things, but you could do worse in a week with Marshall, Jeffery, Johnson, Tate, Watkins, Jones, White, Nelson, Cobb, Hunter, and Wright all on bye. Travis Kelce vs NYJ – Oh yea, he’s back on here. Another one of my guys before the season, he broke out a few weeks back like I said he would vs New England. Since that game in week 4 he’s had a bye and a stat line of only 10-93-1. Still wondering why Andy refuses to use him more, but he’s due for a score this week. Jordan Reed @ MIN – With the return of RG3 will come the return of Jordan Reed. He has yet to score this year, but with RG3 being able to get the ball down field, the threat of Reed everywhere else is just too great. In his first game back I can’t see Griffin going too crazy, he will rely on his tight end a lot. Cincinnati vs JAX – It’s simple, they play Jacksonville. Bortles threw two pick 6’s last week, now that probably won’t happen again, but he is just so erratic back there. Bortles is throwing two interceptions per game right now, if they are still available in your league go grab them, they have Cleveland at home next week. Kansas City vs NYJ – I love watching Mike Vick, but I’m not sure he has anything left. They had 7 sacks last week, and will be pressuring Vick all day. Vick will throw a few picks as well, he looked miserable last week. Robert Griffin III @ MIN – I really hope you haven’t been holding on to him. RGIII just isn’t good. He did not throw a touchdown in his two appearances this year and he really has no value anymore in running the ball. Minnesota is not a hard matchup, but at home I like them to play tough. RG3 has a big arm, but you can’t possibly trust him off the injury for his first start in 7 weeks. Philip Rivers @ MIA – Are you benching him? Probably not, but if for some reason you do have a better option, I’d look there. Miami is actually giving up less than 2 touchdowns per game through the air. Want to know how Cutler, Brady, and Rodgers did vs them? Averaged 234 yards per game, and no one threw over 270 yards. Only gave up 1 touchdown each to Cutler and Brady, but Rodgers went for 3. All I’m saying is it’s a tough matchup, don’t take Rivers as a must start this week. Chris Ivory @ KC – The Chiefs have yet to give up a score on the ground, will that last all year? Probably not. But will Vick and the Jets ever get the ball close enough for Ivory to punch one in? Probably not. Last week Powell, Johnson, Vick, Smith, and Harvin all got carries. Not sure why they want to take the ball out of the hands of their best runner, but it’s the Jets. Look elsewhere this week. Jerick McKinnon vs WAS – Two more weeks. Can we all wait two more week? He has Washington then a bye, then we all lick our chops with Chi, GB, and Car after that. The Redskins are one of the best in the league vs the run. They did give up some yards to Murray last week, but who hasn’t. Resist the urge to use him for one more week, you can do it! Darren McFadden @ SEA – He’s actually been a very viable option this year, but as you can see I like Seattle to bounce back this week in a big way. There may not be anywhere for him to run as the Hawks return home in front of their crowd. I’m not sure why, but the Raiders are also trying to get the ancient MJD involved more, and did last week with 6 carries. Cecil Shorts III @ CIN – Cinci is pretty good at being able to shut down receivers, and I really don’t trust Bortles. Shorts may get some garbage time points, but not something I trust going into an important week 9. I don’t want to be starting any Jaguars if I can help it. James Jones @ SEA – My eggs are all in the Seattle basket this week. Oakland will not be able to get anything going this week. I don’t trust any of those guys this week (Holmes, Thompkins), but listed Jones here as he is their number one wide out. Look for players who do not play on Oakland this week. Jared Cook @ SF – “Two weeks in a row I should quit him?” You bet. He’s inconsistent and has yet to score this year. He’s not a starting tight end for fantasy football. San Francisco should handle the Rams this week as they are coming off the bye. Heath Miller vs BALT – I know he just had the big game last week, but Ben all of a sudden has a lot of weapons, and this week Miller will get lost like he has been for most of the year. The Ravens have also been standing tough vs tight ends all year long. I would look elsewhere if possible. New England vs DEN – Like I said last week after they give us a great performance vs the Bears, and all year really, we can actually drop them now. I know they are a top scorer, but a bye and a very rough stretch vs good offenses is coming up. Their playoff schedule does not offer us much either. Don’t expect much from them this week vs Manning. Have you ever wanted to win tons of money playing a silly little game? Have you been playing year-long fantasy football only to give up on it halfway through the season because your team has let you down? If you’ve answered yes to any of these questions, you’ve found the right place to help yourself start winning money. 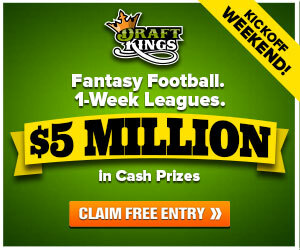 To subscribe, hit the "subscribe" button under the ads on the right side of thefantasysportsguru.com. Once subscribed, shoot me an email at fantasysportsguru22@gmail.com telling me you have subscribed (and for which service: NFL, NBA, or MLB. Once it's confirmed, the day's/week’s article will be emailed to you! I will now be bringing you players and info for Victiv.com and DraftKings as well as Fanduel! QB- Peyton Manning- The game this week against the Patriots is supposed to be a shootout and features one of the best QB matchups of the season. Manning is a beast and his price shows that. I’m going to use Manning in a couple of lineups but he won’t be my featured QB this week. I’ll use him with Demaryius Thomas, Emmanuel Sanders, or Julius Thomas in some GPPs. QB- Colin Kaepernick- It’s hard to ignore his numbers against the Rams a couple of weeks ago. He completed 22 of 35 passes for 343 yards, with 3 TDs, and 29.42 FP. His price is so low for his matchup that he’s going to be under-owned and we can use this to our advantage. I’ll be using Kaep in a ton of lineups this week. QB- Russell Wilson- Every week I tend to suggest Wilson and it works out sometimes, and sometimes it doesn’t. Every other week he tends to have a huge game followed up by a dud. Well, last week was this dud, and now he gets to face the Oakland Raiders. I’m expecting big things from Wilson somewhere along the lines of 300 passing yards, 4 TDs, and add another 85+ rushing yards and possibly a rushing TD. He will also be in a ton of my lineups. QB- Tony Romo- This obviously depends on his status moving forward in practice this week, but he draws a matchup against the Arizona Cardinals and the worst pass-defense. If Romo cain’t go, Brandon Weeden makes a great GPP option this week in a tournament field that he won’t have much exposure to. RB- LeSean McCoy- He had a down week last week but I honestly believe (probably because he was my #1 draft pick in my year-long leagues) that he will come through this week against the Texans. I think people will be off of him this week and that’s what makes me like him even more for the big tournament fields. RB- Arian Foster- I recommended him last week with confidence and he went off. I feel the same way about him this week and absolutely love his matchup against the Eagle’s defense. I’m looking for another 100+ yard game with multiple TDs. RB- Marshawn Lynch- He basically ruined a ton of people’s lineups last week and his price has come down as a result. I think a lot of people will be turned off from him, but going up against the Raiders is just too good to pass up in either cash games or GPPs. I love his value on DraftKings with the PPR scoring. WR- Emmanuel Sanders- After his 3 TD performance, I’m looking for him to dominate once again against a Patriot’s secondary that has been exposed in the past. I think his price is just too low to not take a look at him again this week. WR- Odell Beckham Jr.- Coming off of a BYE, I love OBJ this week against a Colt’s defense that was just torched against the Steelers. His price isn’t where it should be and since he’ll be taking the place of Victor Cruz, and I believe he is very capable to dominate this week. TE- Rob Gronkowski- The beast went OFF on Sunday and he is 100% healthy now and I believe he will be able to dominate the Bronco’s secondary this weekend. I’ll be matching him up with Brady in some lineups and counting the money! TE- Julius Thomas- He hasn’t produced like people have wanted the past couple of weekends but now is the time to pounce on him when others aren’t paying attention. The Patriot’s defense has been beatable this year and Thomas has a chance to dominate as I expect Demaryius Thomas to be double and triple teamed the whole game. Week nine is a crucial time in fantasy football. It’s the point in the season where you’re in one of three positions. Either you’re Winning and rolling towards the playoffs, losing and skimming the bottom, or are up and down win and lose where every game counts. With only five games left its make or break for many owners. Its five games to refine your roster, add depth, or rebuild with some of these key waiver wire acquisitions. It was brought to my attention that some key players were left off last week’s list. And that I also have been adding “new blood” players only. So this week I’ll add some of my previous mentioned waiver wire candidates, all of which are owned in less than 30% of leagues. If Ronnie Hillman, Jonathan Stewart, Denard Robinson, Bobby Rainey, Brandon LaFell, Odell Beckham Jr, John Brown, or Kenny Stills are still available in your league I recommend signing them immediately. If these players are long gone like in every league I’m associated with, then look for the following players for some “new blood”. I’ll list these players by position, percentage of ownership (espn leagues) and their week 9 opponent. The Steelers have been in desperate need of a WR2 all season. Early this year Markus Wheaton flashed but never seized the job. Week 7 was the debut of 6’4” rookie Martavis Bryant who has unique speed (4.41 combine) for a big receiver. Since his debut Bryant has 7 receptions for 123 yards and 3 touchdowns, showing a high level trust from Steelers QB Ben Roethlisberger by being targeted heavily in the red zone. Bryant was college team mates with fellow rookie Sammy Watkins at Clemson, so working in the WR2 role shouldn’t be an issue. The Steelers new high powered offense will give Bryant plenty of opportunities to score fantasy points. Add Bryant and play him as long as the Steelers stay hot. At 5’10” and 225lbs Jonas Gray is a big running back who fills the Stevan Ridley role well. Undrafted out of Notre Dame Gray ran for 791 yards on 114 carries (6.9 avg) for the Irish before tearing his ACL in 2011. Jonas went from the Patriots practice squad to being called up as the second running back behind Shane Vereen all in one day. In week 7 Gray got his first NFL game time with 3 carries for 12 yards, a rather inconspicuous debut. In week 8 Gray jumped to 17 carries for 86 yards leading all Patriot running backs in carries. Shane Vereen has showed he’s more of a hybrid RB/WR, while Jonas Gray will be the traditional running back for the Patriots. Add Jonas Gray for RB depth and value as goal line back. Reggie Wayne’s injured elbow gave Donte Moncrief his first considerable playing time in week 8. The rookie responded with 7 catches for 113 yards and 1 touchdown on 12 targets. Meanwhile veteran Hakeem Nicks had only 1 catch for 27 yards on 5 targets. Moncrief has excellent speed for his size and can get separation from NFL caliber defensive backs, something Hakeem Nicks can no longer do. In the Colts high octane passing game Moncrief will get plenty of targets even when Reggie Wayne returns. Add Moncrief for WR depth with continued break out potential. Rookie receiver Allen Robinson was the Jaguars second round pick this year coming out of Penn State. Robinson and fellow rookie Blake Bortles have created chemistry over the past three games. In that span Robinson has 17 receptions for 210 yards and 2 touchdowns while leading the Jaguars in targets. The Jaguars are not an offensive power house but Bortles increasing comfort with Robinson is a sure sign of things to come. Add Allen Robinson for WR depth and flex appeal. Although on his bye week Theo Riddick is a nice add in most leagues. While filling in for Reggie Bush, Riddick has gradually gained touches from Joique Bell to the point they were nearly even in week 8. Theo Riddick has a similar skill set to Reggie Bush being able to equally catch the ball as run it. Riddick’s quickness allowed him to switch from RB to WR at Notre Dame and then back to RB after injuries left the Irish thin at the position. His receiving skills are a perfect fit for the Lions pass happy offense. Theo’s skill set allows the Lions to use him in multiple ways and increases his value to the team. Riddick will be valuable while Reggie Bush is out and maybe even longer. Old reliable, that’s what Heath Miller is. As the Steelers evolve very few long time veterans have stayed throughout. Sure Roethisberger and Polamalu are still there but not many others. Miller has been fantasy relevant for years and looks to stay that way in the Steelers new powerful offense. A trustworthy target, Miller will be a security blanket for Roethilsberger this season since there’s a lack of experienced receivers in Pittsburgh. Add Miller as a low end TE option or a bye week fill in. Third round rookie running back Charles Sims will be eligible to return in week 9 after spending the first 8 weeks on the IR designated for return list. No time better than now for the Buccaneers who have struggled mightily in the running game this year. With rumors of a Doug Martin trade and now Martin’s injured ankle, Sims is poised to have a big break out. Considered one of the top running back prospects in the draft, the elusive Sims has dual threat capabilities with his rushing and receiving skills. A lot of people are saying Charles Sims is the Buccaneer’s next superstar. Pick up Sims if you’re in need of running back help and stash him on your bench and wait to see happens in Tampa Bay. While he has sat on the shelf for nearly two years Marcus Lattimore is almost ready for action. After suffering one of the brutalist knee injuries in recent football history (dislocated knee, torn ACL, MCL and PCL) with multiple structural damages. Lattimore left South Carolina to enter the NFL draft where the 49ers gambled a 4th round pick on the injured running back. Lattimore is a true wild card for the 49ers, his immense potential and elite running back capabilities are all over shadowed by his rebuilt knee. The league is waiting to see if his explosion and cutting abilities are even close to what they were in college. If Lattimore is the same back the rest of the league better watch out. Marcus will be gradually be worked into the offense and if he can handle it could surpass Carlos Hyde as the 49ers second running back behind Frank Gore. It’s a wait and see approach with Lattimore but I suggest signing him now and stashing him on your bench before he’s in demand. GOOD LUCK! And follow me on twitter for more football news. Week 8 is here and we have lots of fantasy impact on prime-time games. The good news for fantasy football owners is the over has been coming in a lot on Thursday, Sunday, and Monday night games. I do mean a lot, over 80% a lot. The total score in these games has gone over 18 of 22 times in 2014, but now that it is public knowledge we are all in for low scoring games, isn’t that how it goes? Starting the week off on Thursday night is San Diego in Denver. Green Bay is in New Orleans on Sunday night, and the week is capped off by Washington in Dallas. A low score in any of these games would be brutal for the fantasy world. Chances are everyone out there will have at least one guy playing in one of these three games. Without even counting defense or kickers, I’m thinking 37 guys could be used in these 3 games. Don’t believe me? Check it out. Thursday night we’re looking at Manning, Hillman, Sanders, the Thomas duo, and Welker if you need him, for Denver. San Diego you will go Rivers, Oliver, Gates, Allen, Royal, and people may even start Green and Floyd in deeper leagues. That’s 13 players for Thursday night alone. Take a look at Sunday night (which we will be “waiting all day” for), Rodgers, Lacy, Cobb, and Nelson are your for sure starts, then Adams and Starks can be used if needed. On the Saints side you will use Brees, Graham, Cooks, Colston, Robinson, Ingram, and even Stills and Cadet (who I may roll the dice on since Reggie Bush is not looking good) if you have to throw a Hail Mary. That’s another 14 guys, totaling 27 through two games. Moving on to Monday you will go with Morris, Reed, Jackson, Garcon, and maybe Helu from Washington. Romo, Witten, Bryant, Williams, and Murray are all starts from the Cowboys. Add the 10 from Monday night to the 27 we already counted… 37. That’s 37 guys in 3 games, this should be fun. Carson Palmer vs PHI – Getting healthy every week and threw two touchdowns once again in week 7. He’s a good start at home this week vs a team that has had trouble stopping the pass. This offense is rolling now, and can be trusted going forward. Nick Foles @ ARI – Palmer’s counterpart is also a good play this week. Coming off the bye, I like the Eagles to have the offense on track. Arizona has struggled as well vs the pass. Don’t let their performance vs the rookie Carr last week fool you. Jerick McKinnon @ TB – Finally, the reason you have been holding on to him for weeks. Let this man loose! Had over 100 yards last week vs the best rush defense in the league, imagine what he can do vs one of the worst. He will finally get in the end zone and is a fantasy starter from here on out. Does have some tough matchups in the playoffs, but you can ride him to get you there. Joique Bell @ ATL (London) – I feel like Bell or Bush are on here every week, but Bell is the guy I like for week 8. Atlanta is miserable vs the run and have given up a league high 13 touchdowns on the ground. To put that into perspective, tied for second most are the Giants and Panthers. Bell may hit pay dirt twice this week. With Calvin still banged up, all of their tight ends hobbled, and Reggie Bush not practicing today (Thursday), start Bell, who has very high upside this week. **Reminder** The Detroit and Atlanta game is being played in London and will kick off at 9:30am EST, so get your lineups set. Shane Vereen vs CHI – I’m a little upset he had such a big game last week because I love his matchup in week 8. You never know what “Wild Bill” will do as far as game plan with his running backs, but with Ridley done for the season, it looks like Vereen’s role will increase. Not only do I like his potential amount of touches, but the matchup he has with the Bears is perfect. The middle of the Bears defense can be exploited and there will be no one to run with him out of the backfield. He could have 10 catches this week. Mike Evans vs MIN – Now I don’t know how much I trust Glennon, but with the bye week to get everything in place I think Tampa should have a productive day at home vs a pretty bad Minnesota defense. With the week off, Evans should finally be healthy and will see targets. Fellow rookie Sammy Watkins gashed the Vikes last week for 8-122-2, I’m not expecting the same production, but I do like Evans’ matchup. Julio Jones vs DET (London) – Start your studs. I know he has been frustrating the last few weeks by not getting a score in 4 weeks now, but he’s a little banged up and they need him if they want to win. Atlanta will not be able to run the ball at all vs one of the best defenses in the league. Their only hope is through the air. The o-line is very banged up, they need to feed Julio early and often to have any hope. Plus, I think we’ll see a long ball or two to excite the London crowd. **Reminder** The Detroit and Atlanta game is being played in London and will kick off at 9:30 am EST, so get your lineups set. Brandon Marshall @ NE – “The squeaky wheel gets the oil,” especially when it comes to diva wide receivers. That is basically the reason I like Marshall this week. He has only 1 game with 100 yards this year, and the strength of the Patriots defense is their secondary, but when Marshall cries, he usually gets coddled. Watch Cutler target him a TON this week. Andre Johnson @ TEN – Stop me if you’ve heard this before, “The Squeaky wheel gets…” you know how this ends. Fitzpatrick says he is not getting Andre the ball enough, so expect him to get it “enough” this week. Johnson actually has not had less than 7 targets in a game yet this season. We all know touchdowns are hard to come by for him, so I like him for 100 yards this week. He is getting more red zone targets then usually though. Rob Gronkowski vs CHI – He was on here last week, but only had an alright game and produced 5-68 vs the Jets. Like I said for Vereen, the middle of the field will be open. The linebackers and safeties for the Bears will have their hands full with Gronk. There are very few guys in the league who are big enough and fast enough to stay with him, and none of those guys play for the Bears. He will score this week. Martellus Bennett @ NE – He hasn’t scored in 4 weeks now, but continues to have the targets. Cutler will need to find his big man with the wide outs being covered by a really good secondary. New England is giving up a good amount to tight ends, so the matchup for him is not the worst. Be aware he is banged up, but should not be in any danger of missing the game. Houston @ TEN – Hopefully they will be getting the 2014 number 1 overall pick back this week, but either way they are facing a rookie who will be making his first career start. If Clowney plays, lookout. The ears will be pinned back for him and Watt. The Titans are at home, which gives them a little hope, but I still like Houston this week as a streamer. Joe Flacco @ CIN – Before the New England game these Bengals were considered one of the best teams in the league, now they have lost their way. I don’t like Flacco this week for the simple reason being I see the Bengals bouncing back with a win this week. He’s had two good games in a row, but vs Tampa and Atlanta. With the exception of his 5 touchdown explosion in Tampa Bay, he usually does not play as well on the road. I’d look elsewhere this week. Blake Bortles vs MIA – I hope none of you are starting Bortles, but if you plan on doing so, find someone else. He has looked pretty brutal the last few weeks and his touchdown to interception ratio is 1:2. He’s 5 TD’s to 10 int’s on the year. Miami’s D is also playing well and held the Bears in check last week. Tre Mason @ KC – There are two teams that have yet to give up a touchdown on the ground this year, Buffalo and Kansas City. Mason looks like he is the back of the future and should be viable for the rest of the year, but he’s still in a time share and cannot be trusted this week. The KC run D is pretty good, stay away in week 8. Anthony Dixon @ NYJ – The Jets have given up some yards on the ground the last few weeks, but to smaller faster guys (Vereen, Hillman). We also don’t know what to expect this week as far as playing time goes. The Jets are only giving up 88 yards on the ground, and with Dixon being in a time share, there’s just not enough yardage to go around this week. Alshon Jeffery @ NE – Not sure you have enough depth at WR to bench him, but he only has 2 catches for 9 yards last week. New England is number 1 in the league vs the pass giving up only 208 yards per game through the air. It’s a tough matchup on the outside with these strong corners playing man. I like Marshall because of the volume of targets he should get, there may not be enough to go around this week to get Alshon involved as well. Keenan Allen @ DEN – In week 4 Allen had 10 for 135, in weeks 5-7 he’s totaled 12 catches for 110 yards. He’s also yet to score this year. Is Thursday the night he gets in the end zone? Maybe, but I doubt it. He can’t be trusted right now, which stinks because you probably drafted him as your 1 or 2 wr. Jared Cook @ KC – Did you really think the 4 for 74 in week 6 was a sign of things to come? Despite the win at home vs Seattle this team is bad. They are going to KC where Austin Davis is going to look as bad as he did on Monday night vs SF. I wouldn’t trust any Ram this week. Green Bay @ NO – This one is going to be a shootout. Brees has 3 straight games with over 300 yards and 2 touchdowns. The Packers D is not going to be able to slow down the Saints at home. New Orleans really needs this one as well if they want to keep their playoff hopes alive.